If you are looking for the best services for polished plaster Manchester to enhance the look of the interiors of your home and/or office, you can count on KP Ceilings Ltd. We are categorized among the most reputed names in the North West part of the UK. We have experience of over 12 years of offering the most reliable services in this field as we have served some leading names in the industry with our premium services. At KP Ceilings Ltd. we thrive to satisfy our customers with our top-notch services. We leave no stones unturned to ensure our customers are getting complete value for money. With our services, you will get a perfect finishing on your ceilings and walls. We have equipped our staff with state of the art tools and supplies so that they can serve you to best of their potential. Unlike the other leading names in the industry, our services do not cost a bomb. We believe in providing the best experience; thus, we offer our vast range of services including polished plaster, Manchester at reasonable rates that doesn’t burn a hole in their pockets. They are dedicated and committed and have the required expertise to complete the job at hand with conviction and perfection. They utilize their experience, skills, and proficiency to the maximum and ensure each client is fully satisfied. Polished plaster services can enhance the look and value of your home up to a great extent only if it is done by professionals. At KP Ceilings Ltd., we aim to do the same. With the perfect finishing of your ceilings and walls due to our impeccable services, you will notice a drastic improvement in the overall appeal, décor, and look of your home. You are simply required to communicate the look you desire and our clients will start give you exactly the same. Attention to detail will be paid to smallest of details for your enhanced satisfaction. You can either have a marble, limestone, or travertine plaster on your walls and ceilings. We use a special steel trowel to ensure it exudes a glass-like sheen. The specialty of our polished plaster services is that it can retain its shine and value for a longer period of time resisting regular wear and tear. We have received positive and encouraging reviews from our customers on different platforms. These reviews serve as a testimony to our premium services. 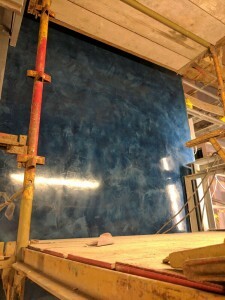 Contact us now at 0161 635 1984 (phone) or 07581 139291 (mobile) to know more information on our services of polished plaster, Manchester or to get a quote.